When Copper is being exported from Zambian mines, it is escorted to the border by private guards from specialised security firms mostly based in Kitwe. But here in the picture, the special guards from one such firm fall asleep while guarding trucks of copper as they made a stop over in Kafue. The export copper was being transported by SABOT trucking company. The guards as seen here move ahead and behind the copper trucks in small cars. And then you blame jerabos. 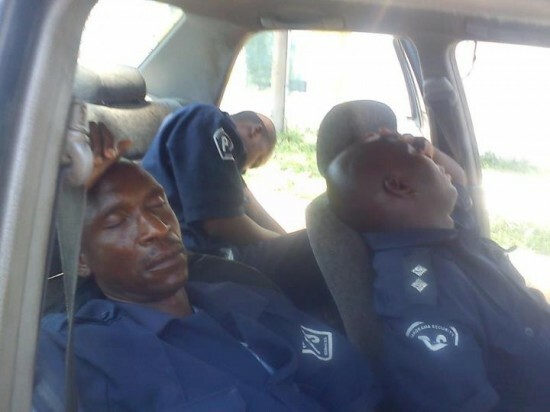 The second photo shows a Zambia police officer sleeping like there are no criminals anywhere in the world. The photo was taken in Mazabuka over the weekend. The police officer is using the gun as ‘pillow’. Then you ask why the Mailon brothers are still at large. Die Hard? MMD’ s Bowman Lusambo flees to Tanzania?